My cousin asked me to add a tutu to a onesie that she has bought for her daughter’s first birthday. I wanted to share how I did it with you in case anyone would like to see. Cut a piece of elastic (you choose your size, just don’t use elastic that is too wide) that is the same width around as the onesie. If you know the child’s exact waist measurement, you could cut it to be waist measurement – 1 inch. 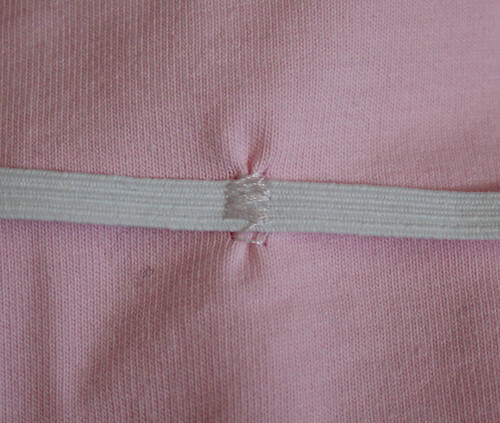 Sew the piece of elastic together. 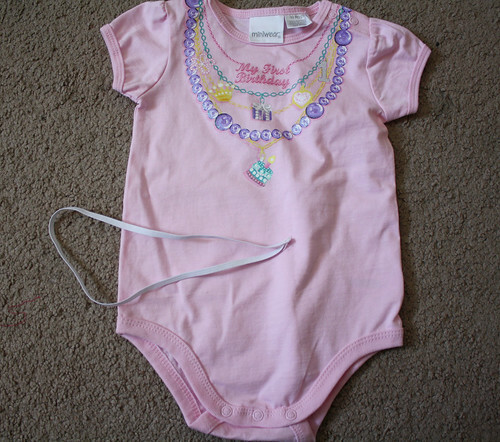 You will then sew it on the onesie in four places: the side seams, the front middle, and front back middle. Use a zig zag stitch. Then, tie on your pieces of tulle (I do double knots). I used this tutorial by Angie at Treasures for Tots for quick cutting. Now, the tutu will stay in place no matter how much moving or pulling on it she does! That is amazing! I love the tutus and this is one I could make so easily!!! Thanks so much!!!! thanks a bunch! This tutorial will definitely be put at work! Oh and thanks for sharing the tutu tutorial! here is my post today! Love it! Where did she get the onesie? How absolutely adorable!!! So quick and easy!!! Thank you for sharing. very cute … but i must know… did you make the design on the oneise or did it come that way? I’m not sure where she got it from, but the label is “Miniwear”. I did not make the print on the onesie, although, Samster Mommy has a tutorial for doing something similar with the necklace part (http://samstermommy.blogspot.com/2009/09/painted-jeweled-onesie.html). This is so darling. Thank you for sharing. There is a little one at church that I want to make one of these for but never found a tutorial for doing so. You just made my day with this post. Love and look forward to each one. Seriously genius Jessica. I love it. These are so cute! You must have so much fun making them. What a great idea attaching the tutu to the onesie! I did a similar thing with tulle ruffles, but only across the backside. I love the idea of a full tutu. I never would have thought of that – so cute! I love these, thanks for sharing. Your blog is wonderful BTW! VERY CUTE! I will have to make one if my niece ends up having a girl! And I will be featuring this on my blog! Great idea! It’s so simple, too. I love that I can actually do this. Thanks for posting this! Well I will be making something similar to that for my little ones first birthday this month. Your tutu onesie came out adorable! I’ve bookmarked it so I can try it too! And thank you for linking to my quick and easy tulle cutting tute! I linked on my Treasures for Tots blog sidebar! Thank you again for the cute tute and for linking my tute too! I’ve seen the onesie at Babies R’ Us! Yes, I recommend washing it on a gentle/handwashing cycle and air drying it though. Can you tell me how to double knot the tulle? Also how long did you make each piece of tulle? I honestly can’t remember how long I made them, but I think it was 7 or 8? And to double knot is just tying a knot twice. How many yards of tulle do I need? It’s really up to how full you want it and the size of the onesie. I used scraps for mine, but I would think 1 yard should be enough. If you want to add more colors, just get a smaller amount of a few colors. You could always try a certain amount and then if you felt like it needed more, add some. Thank you so much for sharing! It is adorable & so easy! I just finished making one for my daughter’s first birthday! It was so easy, and it is super adorable! It’s a great idea, But how do you wash it?!?! That’s simple 🙂 Just pretreat any stains on the onesie. Then wash it on a delicate cycle. Hang to dry. adorable, but how do you cover the areas where you stitched? Wat size elastic did you use? 1/2″? I believe it was. I wouldn’t use anything bigger than that for sure. When I cut tulle for a tutu, I use pre-measured pieces of cardboard – 8″, 9″, 10″ and so on (each one labeled). Then I wrap six inch wide pieces of tulle around the cardboard, kind of like wrapping cloth around a flat bolt. When I have enough (sometimes I count as I wind), I carefully cut each side at the end of the “bolt” or cut on one side to make double lengths. A rubber band can hold the tulle in place if it slips around too much. Thanks for the tutu idea – great! Also, does the tulle maintain it’s stiffness when washed as suggested above? I love the onesie! Where did you get it (if you can remember)? I love this onesie tutu! I’m about to try it myself! How do you know how far up to go from the leg hole when placing the elastic? I don’t have anyone I can model it on to find the waist. Thanks! Do a similar tutu, but found if I tie (I fold each tulle strip in half, loop over elastic, then pull ends through) the tulle to the elastic first, then zigzag the entire covered elastic circle to the onesie, it’s more stable. The looping also creates a nice covered band. An empty fabric board makes a great tulle “winder”. Just the right length for lots of sizes. 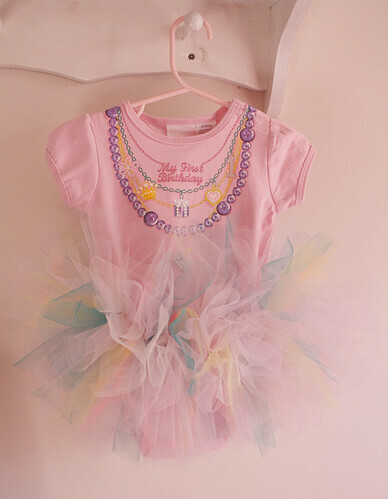 I wanted to make this for my daughter’s 1 year cake smash photos, but when I double knot the tulle to the elastic, it just hangs straight down and doesn’t look nearly as cute and fluffed out as the tutu in the picture. I wonder what I am doing wrong? Any advice would be much appreciated!